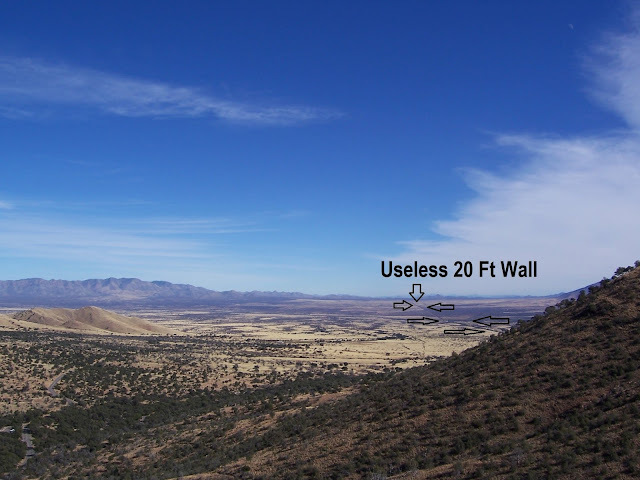 FYI: A useless 20 foot wall already exists between U.S. and Mexico. It stretches into the distance and accomplishes nothing at great expense. The always resourceful Mexicans spent decades developing this incredibly hi-tech anti-wall scaling device that has managed to befuddle American Border Patrol agents. Labs around the country are studying this device for flaws but engineers are baffled by it's application. They thought the wall was impenetrable. For good measure, environmentalists demanded the wall include wildlife migration gates, which turns the 'wall' into an 'open door' for non-human animals. So, the immigrant from Mexico need only wait at one of these gates to follow a deer through it. Or wait for the floodgates to open after a hard rain. I was hiking around the border area and noticed a huge wall that is the border between Mexico and the United States. I've heard Trump's plan is to upgrade this wall at a cost of $8 Billion...which is good news since the only people who will work on that project will be sending the paychecks to Sonora to their extended families. It's a classic attempt to hack at the branches of a problem and ignore the roots.